Corals have it rough. From warming oceans to sunscreen, threats are everywhere. Now, add freshwater to the list. A study out last week in in the journal BMC Genomics documents how low levels of salinity can stress out corals. The research highlights yet another environmental problem that may become more frequent in a warming world, due to an increase in the intensity of severe rainfall events. Climate change may increase the severity of tropical cyclones, including upping their rainfall. 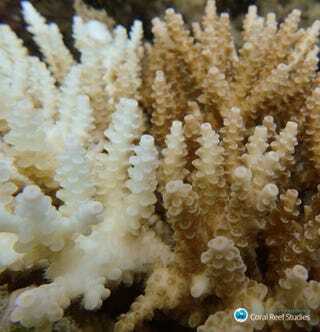 By making corals’ watery environments less salty, this can result in 'freshwater bleaching', a biochemical response similar to what happens when corals bleach due to excessive heat, according to a press release. But unlike heat-related bleaching – which corals often recover from after temperatures return to normal – the response these researchers are concerned with may result in mortality after a few days. The new study is an attempt to understand what’s happening in corals on a biochemical level when they’re exposed to freshwater by monitoring changes in gene expression. During the course of the experiments some of the corals died, although mortality rates weren’t quantified. Others showed physical indications of high stress levels. 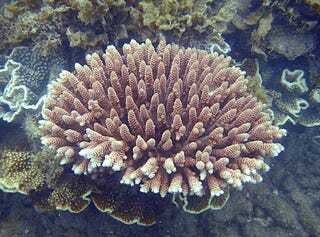 The researchers collected eight Acropora millepora coral colonies from the Great Barrier Reef off Orpheus Island in Queensland, Australia in June 2013. These branching corals, often purple in colour, were placed into water tanks for 24 hours that were kept at different salinity levels ranging from a low of 25 PSU, the unit measurement for salinity, to a more normal 35 PSU. They also conducted experiments on six juvenile coral colonies from the Great Barrier Reef’s Trunk Reef, which were kept under similar conditions (with a low of 28 PSU to avoid the quick mortality the juveniles experienced at 25 PSU during a pilot study) for up to 48 hours. After this exposure, both adult and juvenile corals experienced dramatic genetic-level responses suggestive of “catastrophic cellular damage”, said Miller. He explained that while low-salinity triggers some of the more 'general' stress responses corals exhibit during high-heat stress, a key difference in this case is that the cells begin to destroy damaged proteins. Juvenile corals responded more dramatically to the low-salinity conditions than adult corals. “It seems that juvenile corals are much less tolerant, more sensitive to low salinity than are adult corals,” Wayward told Gizmodo, while noting that juveniles did appear to acclimatise to their conditions after two days. The study is very preliminary; it only looked at one species of coral and the experiments were fairly short. But it points to another potential threat corals face in a warming world, according to Miller. Once scientists better understand why corals are responding to salinity they way they are, perhaps they can begin working on a solution. In the year of living coral, corals deserve that. Correction March 1 11:38 p.m. GMT: David Miller was incorrectly identified as David Hayward, a researcher with the Australian National University’s Research School of Biology, who is another author on this study. We apologise for this error.